The discussion, widely attended by prominent policy makers, national legislators, practitioners and experts from various institutions including Ministry of Foreign Aﬀairs, PNRA and PAEC was Chaired by the Former Chairman Pakistan Atomic Energy Commission, Dr Ansar Parvez; speakers for the event were Dr Anton Khlopkov, (CENESS), Russian Federation, and Ambassador (R) Zamir Akram, Pakistan’s Former Representative to the United Nations and Geneva. The speakers discussed the potential for civil nuclear cooperation between Pakistan and Russia. 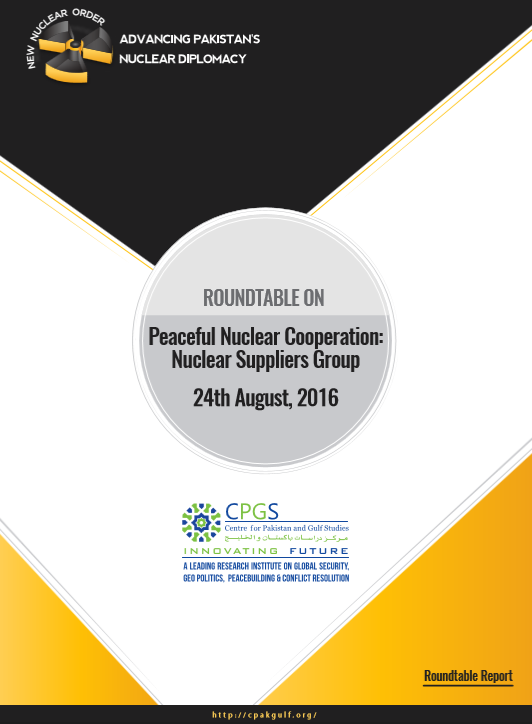 Pakistan’s eligibility, application and entry into the Nuclear Suppliers Group (NSG) was also debated. Senator Sehar Kamran (TI), President, CPGS, in her welcome remarks, stated that Pakistan has an advanced nuclear program. She said “Pakistan has the experience, expertise, credentials and immense untapped market potential, in addition to the manpower, infrastructure and ability necessary to supply NSG controlled items.” Pakistan possesses every quality to render it an invaluable addition to the group, she added.